The MF Fashion 'The Last Emperor' editorial revolves around a simple photoshoot that relies heavily on regal portraiture poses. As though capturing a royal family, models Meghan Collison, Mackenzie Drazan, Maud Welzen, Jac Jagaciak, Hanne Gaby Odiele, Kati Nescher, Ondria Hardin, Julia Nobis, Marie Piovesan, Sara Blomqvist and Caroline Brasch Nielsen pose alongside head designers Maria Grazia Chiuri and Pierpaolo Piccioli of Valentino in a tribute to the enduring and timeless brand. 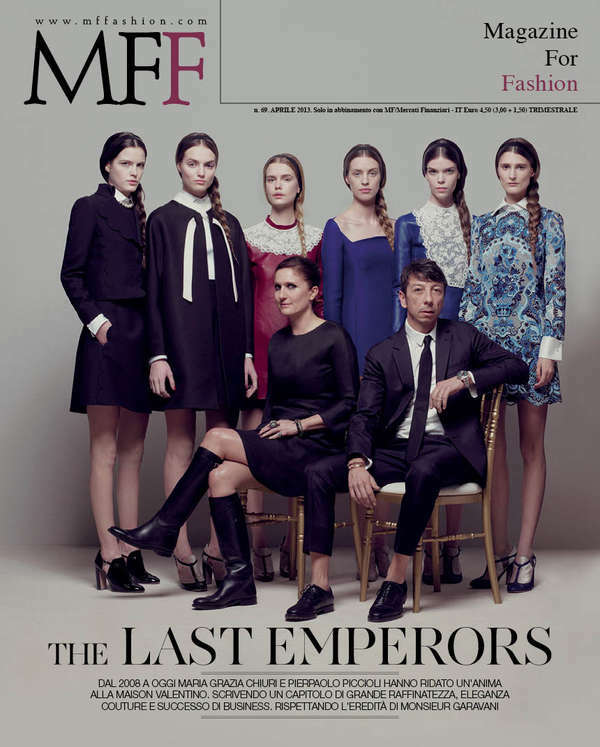 Shot by photographer Pablo Arroyo, the MF Fashion 'The Last Emperor' editorial was styled by Stefano Roncato. Showcasing Valentino's fall winter 2013 collection, the elegant looks have been complemented with side braids, headbands and barely-there makeup. The studio photoshoot for the Italian style bible was captured in Paris, France.